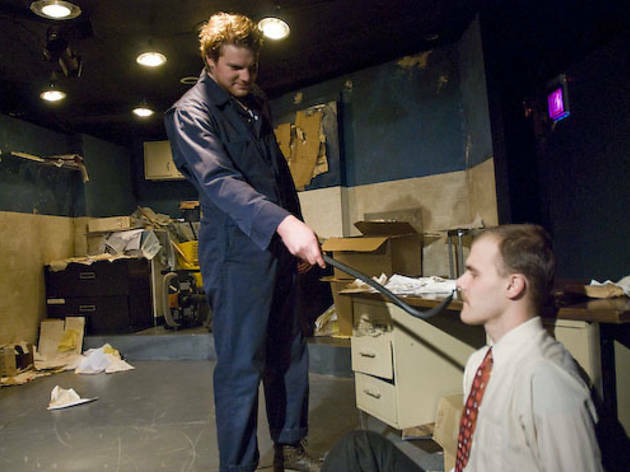 The Inconvenience’s revival of Brett Neveu’s sadistic 2006 piece about a trio of brothers enacting an elaborate, private game of ultraviolence is a stunner, dense with theatrical invention and intensity. There is nothing subtle about Neveu’s sadistic 2006 piece. A fraternal trio enacts an elaborate private game of ultraviolence until Rick (Chmelik), the brother who’s returned home from Hollywood, plays his ace card: his employer, action star Lawrence Stephens (Goldring). Once Stephens is acknowledged as “earl,” via the complex, never-explained legislative principles governing the ritualistic play, the balance of power shifts decisively. 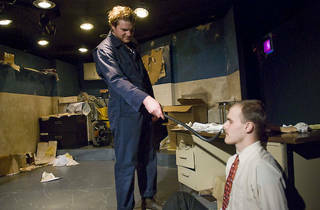 Like a grind-house picture scripted by Harold Pinter, The Earl spins out its merciless confrontations in a spellbinding abstract idiom, its myriad countdowns and invocations of obscure points of order punctuated by vicious tire-iron beatings. Its mélange of delayed adolescence, movie-promo cliché, legalism and brutal shock tactics unnervingly captures the mood of America in the aughties. The production marks the Inconvenience’s emergence from its underground status, and it’s a stunner. The three twentysomething actors playing the brothers lunge and thrust at one another with unbridled ferocity, expertly counterpointed by still moments of silent plotting. Chuck Coyl and Bourque’s dazzling fight choreography, along with exuberantly gory special effects, makes The Earl a stomach-churning carnival of testosterone-driven damage. Elder statesman Goldring, who originated the role in A Red Orchid’s premiere production, out-Norrises Chuck Norris in a deliciously hard-boiled performance. You’ll have trouble finding an hour denser with theatrical invention and intensity, even if you don’t count the minutes your hands are over your eyes.